These six schools churn out Fastpitch stars at a rapid pace. Softball was invented in 1887 in Chicago and was originally called a number of different names including indoor baseball, mush ball, playground, softbund ball and kitten ball. Interested in playing or watching softball? Consider one of these six schools -- their programs are responsible for nudging players toward the USSSA Pride softball team, the flagship team of the National Pro Fastpitch (NPF) league. Think fast! Though softball players rarely get paid as much as their male counterparts, most of these talented women have successfully competed in the Olympics. University of Washington is known for producing some great softball players: Ashley Charters graduated in 2009 after winning a national championship title; Jenn Salling graduated in 2011 with several awards under her belt; and Nikia Williams is impressively still continuing her senior year despite her professional status. We can see why these athletes chose to play softball at University of Washington – its program currently holds the fourth spot in the NCAA rankings. In addition to playing for the USSSA Pride (one of the most powerful softball teams in the country), Ashley Charters also is the co-CEO of Glitterbrandz, a company that designs softball gear for youth leagues. Caitlin Lowe won gold at the 2007 Olympics in Rio de Janeiro. Gionna DiSalvatore finished in the top 10 of the NPF in average and home runs in the 2012 season. Kristyn Sandberg won the National Pro Fastpitch Rookie of the Year award in 2012, the same year she graduated from the University of Georgia with a degree in health and physical education. We can see how the program parlayed her into such a great career; the Bulldogs are nationally ranked in the NCAA, and their multi-million dollar softball stadium comes complete with a players’ lounge, video scoreboard, training room, press box and capacity of 1,400. 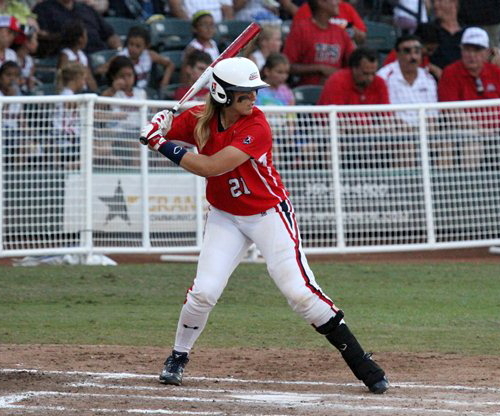 Kristyn Sandberg is a catcher for for the USSSA Pride, a professional women's softball team. The University of Texas has three alums on the current Pride roster: 2007 corporate communications graduate Megan Willis, 2006 psychology graduate Cat Osterman and rookie Blaire Luna, who graduated in 2013 with a degree in physical culture and sports. University of Texas is serious about its sports, and softball is no exception; McCombs Field is one of the best collegiate softball fields in the country, and the school’s team is currently ranked third in the NCAA. 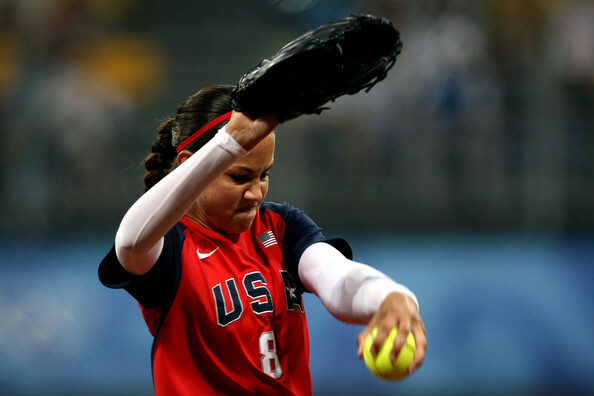 Cat Osterman has won two Olympic medals: In 2004 she won gold in Athens and in 2008 she won silver in Beijing. Rookie Keilani Ricketts graduated in 2013 after serving four years as the University of Oklahoma’s most celebrated softball player in history. We can certainly see what attracted her to the program -- the school’s softball team has the best run average and fourth best batting average in the NCAA. Keilani Ricketts won the 2011 World Cup of Softball. We commend these softball players for displaying true “girl power” -- after all, they’re anything but soft on the field!